VoicePicker simplifies the use of the speech synthesizer, in particular when reading texts in different languages that require frequent changes of voice. To read a text, just select it and drop it in the window of VoicePicker on the voice you want. Or copy the text to read to the clipboard, and then click on the voice you want. Choose format of the Audio Files created by VoicePicker: AIFF-C (.aiff) or MPEG-4 (.m4a). VoicePocker indexes the voices wich are available on your computer. VoicePicker is now ready to read any text using any of the selected voices. - To read a text, select it and drop it in the window of VoicePicker on the voice you want. - To read the clipboard contents, just click on the voice you want. - Choose between "Listen now" and "Save as audio file". - Choose the format of the Audio Files created by VoicePicker: AIFF-C (.aiff) or MPEG-4 (.m4a). The main window can be permanently visible or visible only when a key combination is kept down. - Want to know more? Have a look at VoicePicker Help or watch the videos below. Click on the button below to get VoicePicker for less than one dollar. This application is delivered without any voice : VoicePicker uses only the system voices (and eventually the third party voices) installed on your computer. macOS proposes, with its vocal synthesizer, a great number of voices suitable for many languages. 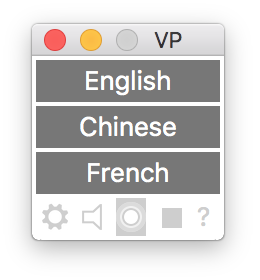 However, most of these voices (in particular for non English languages) are not installed by default. They may need to be downloaded. Downloading a system voice is easy (see VoicePicker Help) and free, but may take some time because a voice is a rather heavy file. Display VoicePicker Help (included in the application). "A cool place to store the texts you often use."